When you stay at the Clarion Collection Hotel Skagen Brygge, you'll be right in the midst of Stavanger's fascinating maritime history. And you'll be able to enjoy wonderful views of the water too. This stylish hotel has won numerous awards for its architecture and it has become a real symbol for modern Stavanger. 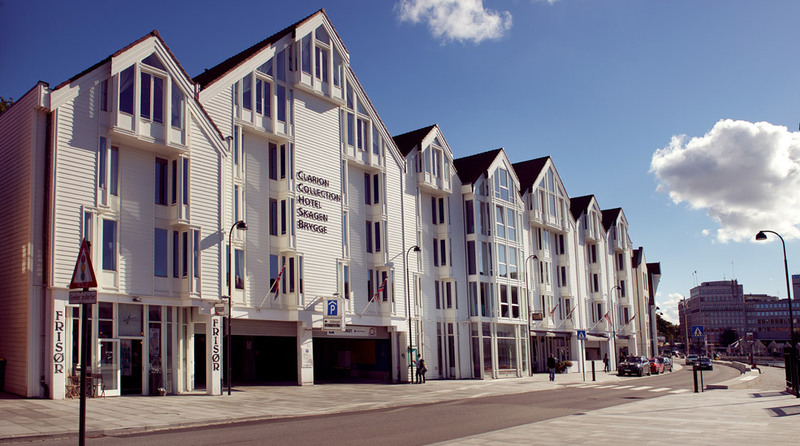 The Clarion Collection Hotel Skagen Brygge is located right by the quayside in central Stavanger. You can enjoy idyllic views of the harbour and the nearby Old Stavanger district, with northern Europe's best preserved wooden buildings. Just around the corner you'll find the charming pedestrian part of the city, with its interesting shops, restaurants and cafés. Stavanger's main attractions such as the Pulpit Rock (Preikestolen), the Lyse Fjord and Valberg Tower, are also within easy reach. Read more about Stavanger here. Clarion Collection Hotel Skagen Brygge is cash-free, which ensures added security for our guests and visitors. More information about this can be found under FAQs. We understand the importance of being able to stick to your exercise regime, even when you're travelling. You can either enjoy a workout in our newly renovated hotel gym or head to the Elixia gym just five minutes away. Both cardio and weightlifting facilities are available here. Stavanger has a thriving golf scene. The Sola Golf Club is located 15km from the hotel, and it has an 18-hole and a 9-hole course, as well as a fitness centre. The area in which Clarion Collection Hotel Skagen Brygge is located has a long and exciting history, characterised by Stavanger's many years as a hub for the country's herring fishing industry. The city also became Norway's oil capital, after Statoil established its company headquarters here. The Clarion Collection Hotel Skagen Brygge was built in 1988, and has played a key role in shaping contemporary Stavanger. Our award-winning building, with the Valberg Tower in the background, is often depicted on tourist images of the city. Airport bus to Stavanger station. phone +47 51 90 90 00.
approx. 20 mins by car.